We paid a visit recently to one of my favourite toy stores in the whole world, Hot Toads. The physical store itself isn’t all that impressive — it’s a small, concrete-floored basement room in a medical building, with sparsely-stocked wooden shelves, draped with puppets and stuffed toys hanging by clothespins from simple lines strung across the room. The back wall features a working 10-foot long model train table made entirely out of Lego. But it’s not about the decor — it’s what they carry that makes this place special. Plan Toys. HaPe. Schylling. Plastic toys made from recycled milk jugs. Non-toxic wooden toys. Toys intended to enrich the mind and body of your children, not just feed into consumerism and branding. And for me, it is a local store, within driving distance, right here in Atlantic Canada. Unfortunately for my American friends reading this, while they do take online orders, Hot Toads only delivers within Canada. Sorry, eh? One of the many cool items they have is a line of large toy cars called E-Racers, from HaPe’s Bamboo Collection. I had a nice chat with the fellow working there, and learned that apparently these were the first toys to be made from bamboo. I was surprised that, while bamboo has been used for clothes, cutlery and dinnerware, flooring and even wallpaper for some time, the idea of bamboo toys was still relatively new. He also filled me in on a fact I had previously been unaware of. Of course, bamboo is the new golden child of the eco movement: it grows easily and quickly without pesticides, and is therefore a readily renewable resource with low environmental impact. Bamboo wood is attractive and sturdy, and bamboo cloth is soft and has natural antibacterial properties. As worldwide consumer demand for bamboo has increased dramatically in recent years, some companies have taken to clear-cutting hardwood forests in order to make room for bamboo plantations. And despite bamboo’s rapid growth, difficulty in seed propagation combined with over-harvesting has even threatened some species to near-extinction. Why can it never be simple? Every responsible ‘green’ option we come up with seems to lead to more problems and unintended consequences. CFL lightbulbs reduce energy usage by up to 75%, but then you have trace amounts of mercury to deal with. Nuclear power creates no air pollution… but then what about the radioactive waste? Replacing the plastic in your home means using more wood — which means cutting down more forests — or more metal, which must be refined and processed using lots of energy. Safe, organic produce is trucked in from thousands of miles away, polluting along the entire journey and displacing local farmers who cannot match the prices. Using home cloth (diapers, menstrual products, napkins, toilet paper, handkerchiefs) keeps disposable junk out of the landfills, but adds to your energy and water use cleaning them. 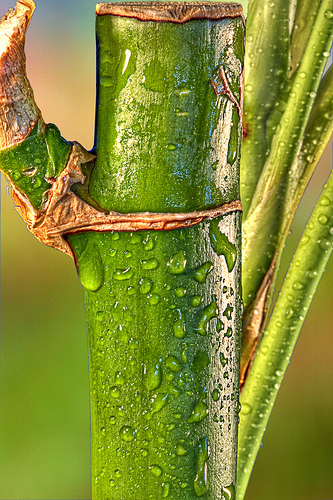 Making that luxurious bamboo cloth is frequently a toxic chemical-intensive process. And the demand for this eco-friendly bamboo leads to clear-cutting of natural hardwood forests. In most of these cases, the eco-friendly solution, while imperfect, is still a step in the right direction. Sometimes a huge, ginormous step. It’s ridiculous to say that because a proposed solution is not absolutely perfect, we should therefore stick with the far worse status quo. I think of the CFL lightbulb controversy… yes, the mercury is an issue, but in my opinion it is by far the lesser of the two evils (there’s more mercury in a standard watch battery, for instance, and we don’t hear boo about that!). We should not stop working towards a solution that’s even better still, but that does not mean we should stay with the old-fashioned and wasteful technologies until then. But clear-cutting hardwood forests to plant bamboo? That’s hardly a lesser evil. That’s just greed. It’s an unfortunate example of how the positive trend towards eco-consumerism is spawning a negative drive to commercialization and profit-mongering. Every company now wants to brand itself as “green”, but you must look beneath the surface to discover how responsible they are truly being. Green living has led to green-washing. Unfortunately, there is next to no regulation or transparency in the bamboo industry, and even digging up information about this particular problem is very difficult. HaPe assures us that they are very strictly careful with where their bamboo comes from, and that their Bamboo Collection, including E-Racers, are responsible choices. But we as consumers need to take more responsibility on this issue, and demand clear answers from all companies whose products we purchase — where do our bamboo fabric, cutlery, and wood products actually come from? really good post. I have never heard our difficult choices described so elegantly. As for the sourcing, much of that, as you alluded to regarding your toy store, is the responsibility of the buyer (at all levels). This means that supply chains have to become more transparent and resources gathered in a way which consumers like. I think you are on the cutting edge here and that more consumers will follow your lead into the search for properly resourced, properly sourced, properly assembled goods–full life cycle analysis etc. Of course, that requires a cognizance about the need versus want issue in our buying consciousness. If I understand, the clothes, diapers and sheets that one buy in bamboo in the hope of avoiding chemicals touching one child, can be more harmful than non-organic cotton? I didn’t know that was happening with bamboo. Ugh! It’s always something. But buying wood or metal is still better than plastic. We need to buy things once! Buy things that are built to last and stop living disposable lives – constantly upgrading to a new style each year! We need to think like our grandparents and great grandparents. If everyone only needed one sturdy, quality set of something and didn’t need to replace – but repair, we wouldn’t have to worry about using up all our natural resources. I mean, Apple just came out with a laptop that you can’t replace the battery. That means a new laptop when it runs out! How irresponsible to the environment. And I LOVE my Mac. But, c’mon! And all Mac laptop batteries can be changed and thank heaven! Those cannot simply live as long as the laptop useful life. But I agree with you for buying things that last. I recently buy utensil sets made of bamboo in the hope of decreasing my use of disposable plastic utensil set, and I am sure it is a lesser evil! Of course, sustainability must be approached at all levels–thanks for highlighting the issues around bamboo production. I recently watched a panel talk from the Slow Food group on Fora.tv at http://fora.tv/2008/08/30/Slow_Food_Nation_Closing_1_of_2 and a man named Wendell Berry talks about this a bit. He says that we have shown remarkable ingenuity and amazing intellegence in the creation of technologies, such as nuclear power and other major developments, but that we do not know how to follow through or “clean up the mess” these all seem to leave behind. I liken it to the “having just enough knowledge to be dangerous” and refusing to educate yourself further. Eric Schlosser also makes a point of talking about how the Slow Food movement (and this can be said for ANY movement) has the potential to become extremely narcissistic if things like this are not taken into consideration. We have a severe lack of “transparency” in this country when it comes to where our products come from and how they are made.